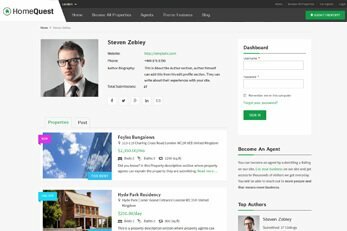 This properties WordPress theme helps you create, manage and monetize a real estate classifieds portal. 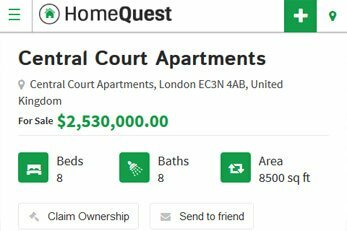 As well as this, you can also use HomeQuest for any other type of classifieds or online business directory for various businesses such as Cars, Hotels, Restaurants, Travel Destinations etc. The flexibility of this theme gives you endless options of what you can use it for. This is another one of our elegant child themes for our Directory Theme. 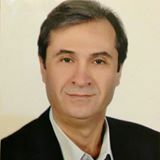 The parent theme is included with the HomeQuest Standard or Developer license. The Directory is where HomeQuest gets all of its power from. 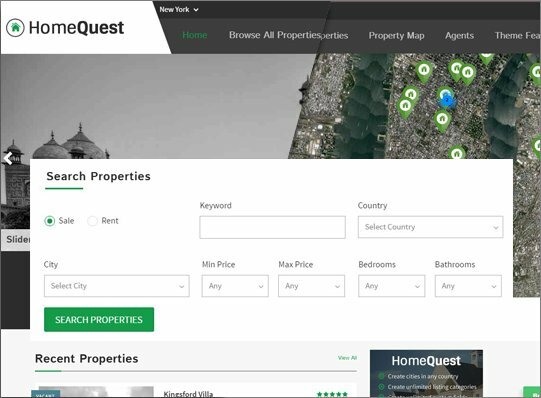 HomeQuest also includes our Real Estate plugin for all of its property classified features such as the property search functions and much more. 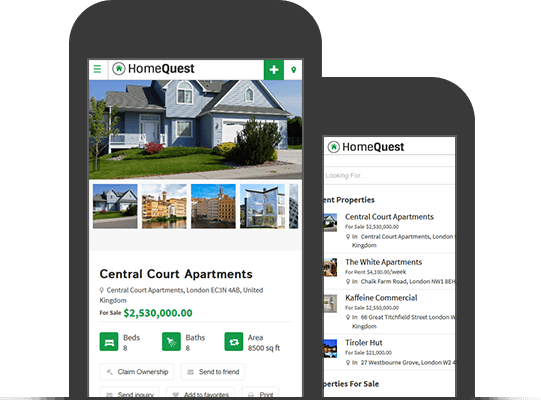 HomeQuest is a responsive real estate classified theme but it also comes with a cool mobile app view. You can activate this option from the dashboard to provide the visitors a fast loading and minimal view. Once activated, estate agents, brokers, home owners and property hunters alike will find it very easy to navigate your property portal from any mobile device. 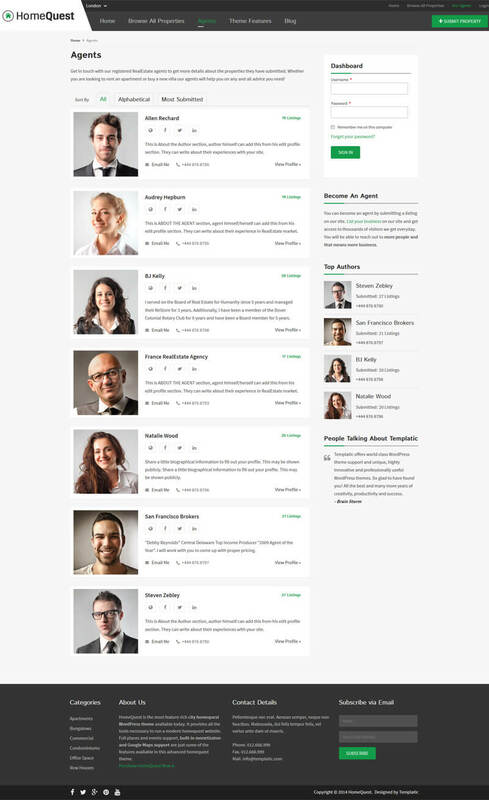 The responsive view is also good for mobile devices, this is just another option we have given you with theme. You can take a look at how HomeQuest looks on mobiles by visiting its demo here. 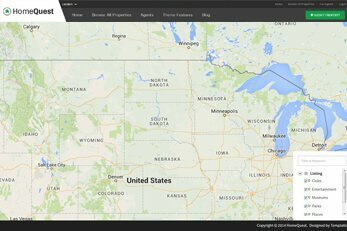 A powerful searchable homepage map which acts like a property finder system. The map shows all the properties, categories where users can use search option to find properties. This also applies if you wish to use this theme for anything other than properties. 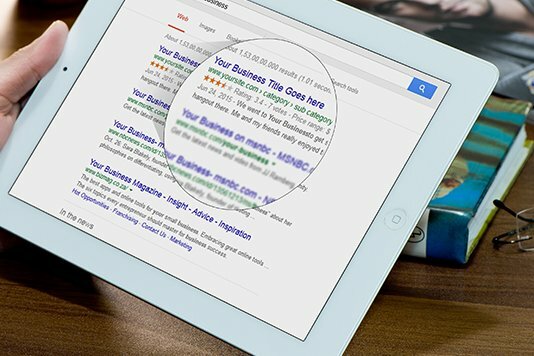 Search pages are very important for any property hunter on your real estate directory website. The flexible and customizable advanced search is what gives this theme the extra edge. 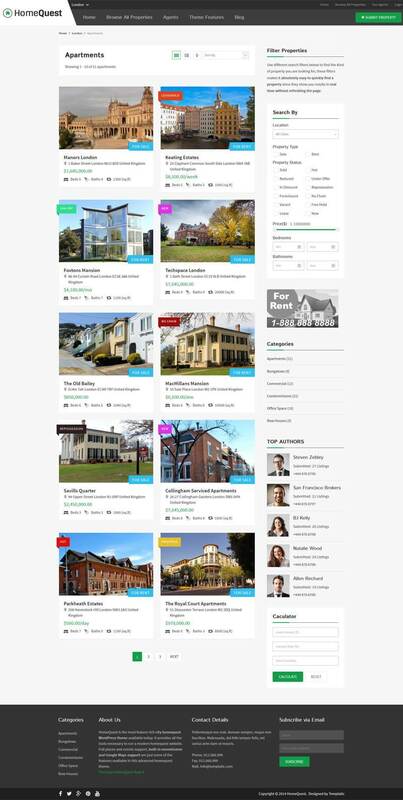 This property theme comes with several different colors associated with different property types. 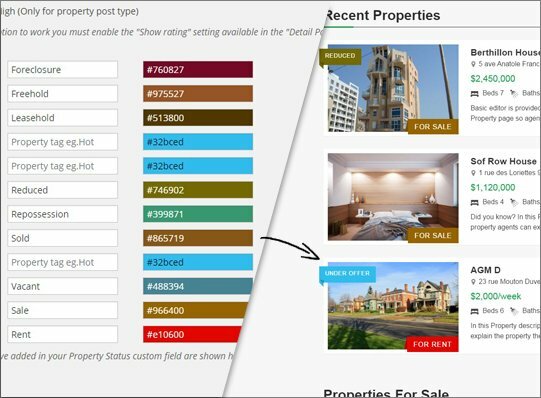 As an admin, you can set the titles and colors for each property type, These color tags are displayed on the various pages such as the homepage and property listing pages. 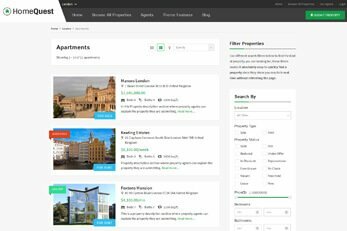 These tags highlight the status of a property listing so that the users can instantly find out the status/type of the property. You can easily edit and add more property tags from the dashboard. 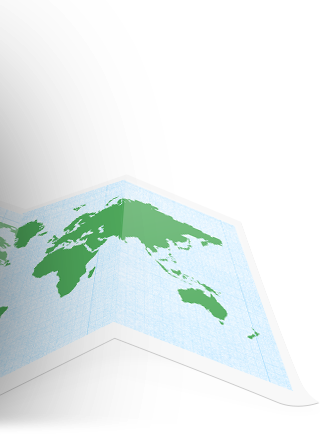 The homepage banner area can be used in three different ways. 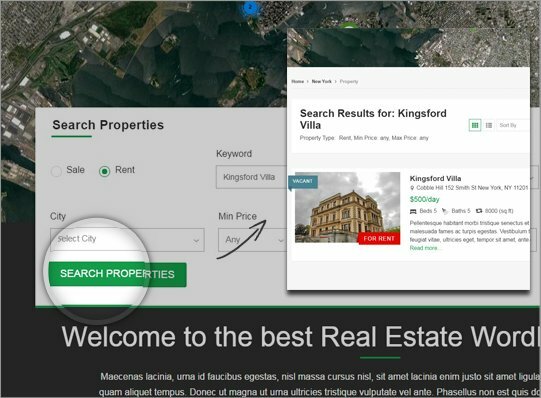 You can place an attractive image slider to show custom images, display images from property listing categories or use this area to display the big Google Map with properties marked on it. Each property comes with its own header image which displays images of a property as a gallery. Property submitter can upload images to a property listing and these will automatically show on this slider. Need to charge for property listing submission and monetize your website? HomeQuest comes loaded with great options to let you do just that. This flexible theme also lets you create free submission packages. If it’s charging estate agents or homeowners to submit property listings you require, check out just some of the features below. Create unlimited property submission packages. 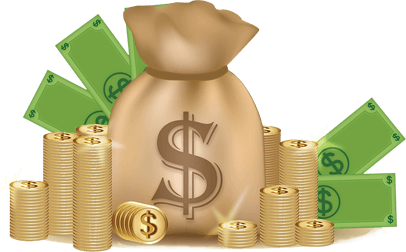 Create Recurring payment submission packages. 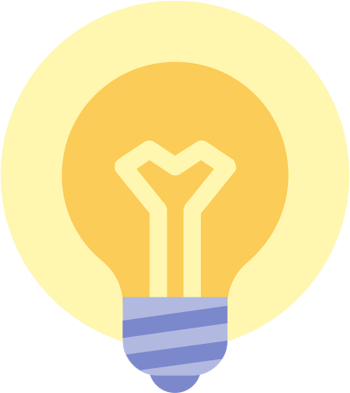 Publish banner ads or AdSense on your portal. Claim Ownership on listings (optional). 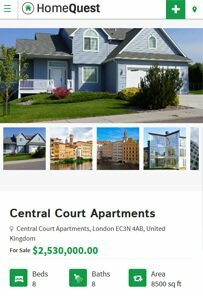 Charge for featured property listings. 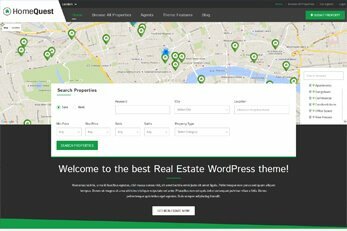 Search engine optimized and ready to go, this powerful property listings WordPress theme works with the best free SEO plugins available today such as Yoast SEO, All in One SEO, Google XML Sitemaps and All In One Schema.org Rich Snippets. HomeQuest also comes with a built-in URL customizer. This great tool lets you change or remove several URL bases to help you with the work on SEO. This theme is tested with the popular WPML plugin which is great if you need to run the theme in multi languages. HomeQuest can also be translated into any language instead of English with the provided .PO and .MO files. You don’t need the WPML plugin to be able to do that. This property listing theme also comes with RTL (right-to-left) support for languages such as Arabic or Hebrew. The HomeQuest theme is compatible with some of the most popular WordPress plugins. These are just some of the features why you’ll love this theme. 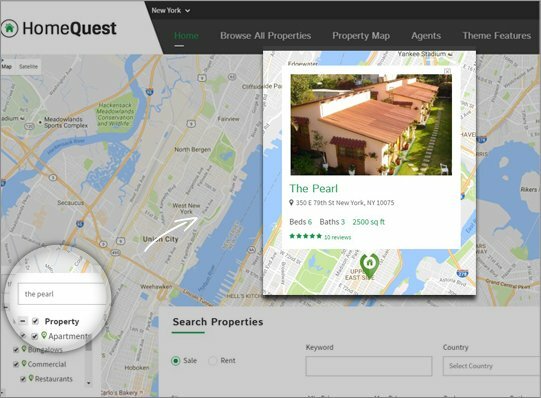 HomeQuest is built on our powerful, Directory Theme Platform. 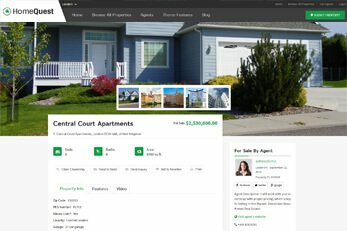 It has hundreds of features to help you launch an amazing property classifieds website. 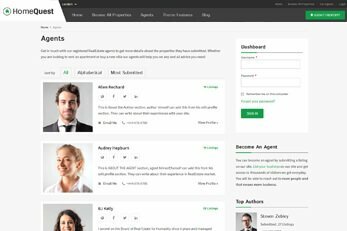 If you are a real estate agent, you can also disable front-end submission and only add the properties on your portfolio. On your classified site using sample .CSV file provided with this theme. Using advanced settings and options provided with this theme platform. Listing owners can easily add and manage their own property listings. Property power search and simple search is provided with this theme. Google Maps are created for each property listing. 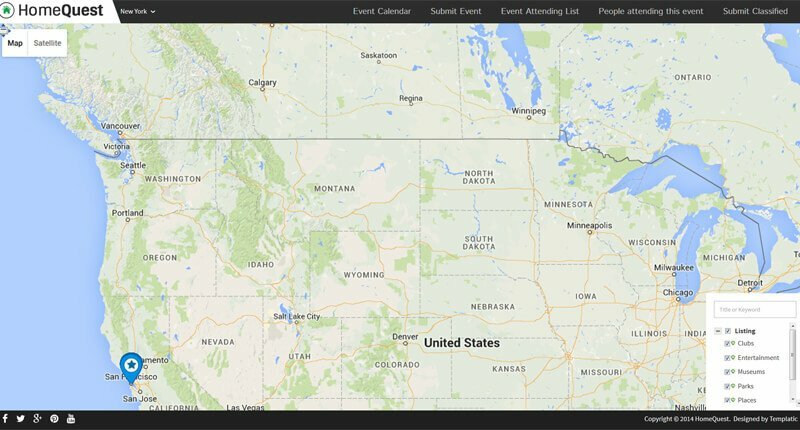 Category, search results, all-in-one map. Add additional custom fields which can be searchable or category-specific if you like. Enable/disable user registrations. Easily manage users and their listings from admin dashboard. Dedicated user dashboard is provided for each registered user and listing owner on your site. Various email notifications are sent at different events. Manage message templates. HomeQuest is very flexible when it comes to using it for sale or rentals property HomeQuest. You can use this as a theme for homeowners with many property submission features such as single and subscription type packages. 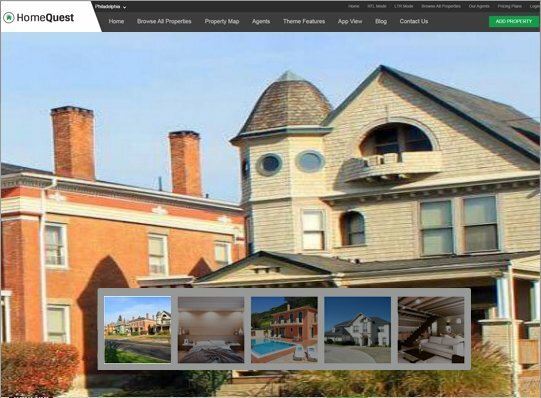 The theme offers many customizable options which make it ideal for matching almost any real estate portal. 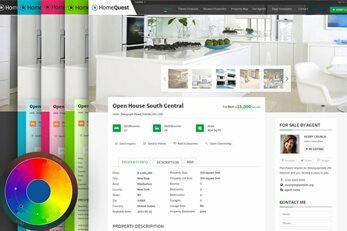 HomeQuest is also the perfect real estate agents theme to solely showcase their properties. 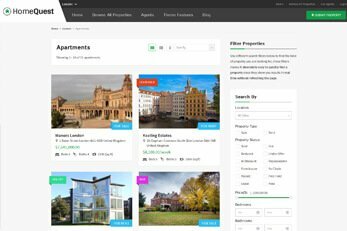 The theme allows frontend property submissions which can easily be switched off when used by one realtor. You can also use HomeQuest to allow both homeowner and property agents to submit properties on free or paid plans. Enhance the built-in functionalities of HomeQuest with 30+ advanced paid add-on plugins. 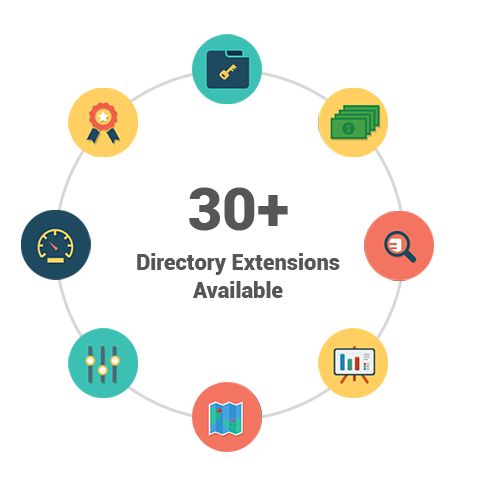 These are just optional if you need to add any of their extra functions for example to your property classifieds portal. Use this powerful plugin to manage the content of your Directory site with intuitive front-end WordPress editor. You can create beautiful looking web pages without changing a single line of code. Use the built-in skin builder to change design elements and the styling of your website. 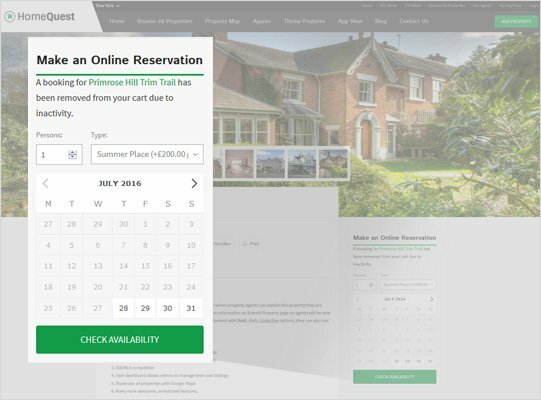 Need to offer a powerful reservation and booking system on your directory? We have you covered with integrations to the industry’s best booking services. By Installing WooCommerce Booking plugin you can turn your website into a fully fledged booking system. Allow users to book hotel accommodation, rental properties, hire cars, book tours, appointments or even restaurant tables and a lot more. The PayPal payment gateway is included with the HomeQuest theme. So you can start accepting payments for the submissions – All you need is an account with PayPal! You also have the choice of 15+ compatible paid payment gateway add-ons. So you can pick up the one that suits you the best. Excellent Products which helped me get started! So you've decided to launch that amazing online property portal? 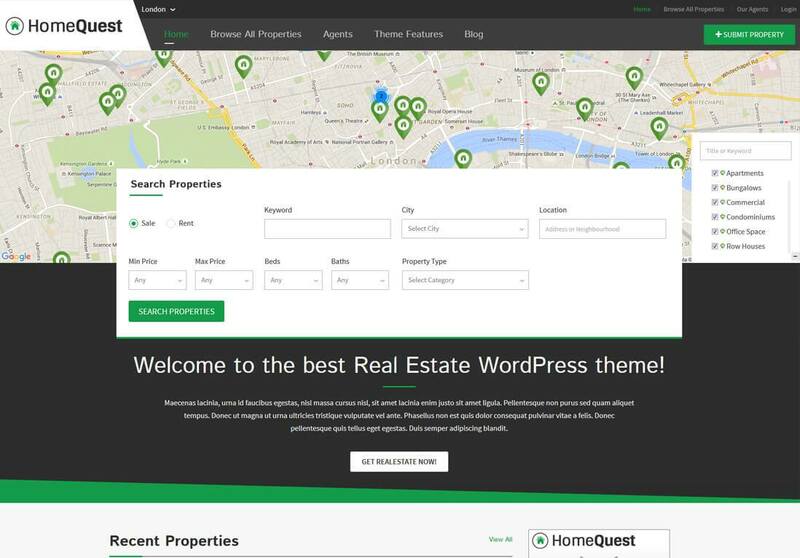 HomeQuest is the ideal real estate directory theme built just for you. Let agencies, realtors and homeowners submit property listings. Get HomeQuest today and realize your dream site.